The HD 5/12 CX Plus is a lightweight cold water high-pressure cleaner. Its compact, upright design complete with a variety of outstanding features including a unit mounted hose reel make this unit extremely versatile for fast and thorough cleaning in many cleaning applications. The HD 5/12 CX Plus is a lightweight cold water high-pressure cleaner. Its compact, upright design complete with a variety of outstanding features including a unit mounted hose reel make this unit extremely versatile for fast and thorough cleaning in many cleaning applications. With a retractable aluminium handle, users can adjust the height to suit their requirements. 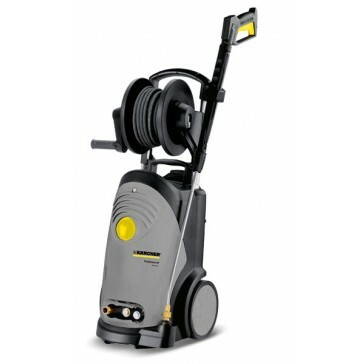 As with many Karcher cold water pressure cleaners it features a rugged 3 piston axial pump with brass water inlet and cylinder head for a long service life, a dirtblaster for increased cleaning performance and automatic pressure controlled shutdown upon trigger release for low energy consumption.